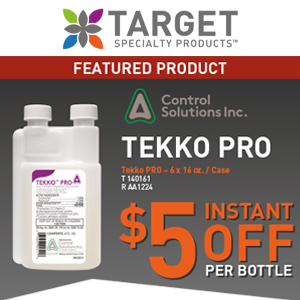 Tekko Pro Liquid Concentrate from Control Solutions Inc. contains a juvenile hormone analog (pyriproxyfen) and a chitin synthesis inhibitor (novaluron). Tekko Pro is a combination insect growth regulator that disrupts the life cycle of listed insects, preventing them from developing into adults. Labeled for indoor or outdoor use on furniture, carpets, kennels and more, it is effective against ants, crickets, fleas, flies, gnats, mosquitoes, cockroaches and more. Now through Feb. 28, receive $5 instantly per 16-oz. bottle: T 140161 or R AA1224.